And… you’ve gotta be a Mac user. *sigh* This little tidbit bummed me out. Martha: I understand. You should check out http://www.literatureandlatte.com/links.html (scroll down to the Writing Software for Windows section) for links to, and brief descriptions of, writing software for Windows users. Maybe you’ll find something equally cool! Initially, Gwen, thank you very much for your post! So glad that you are getting more from Scrivener by playing around with the features. News on development progress will be posted to that newsletter group first. David: Thanks for stopping by, and for the tweet! I can’t sing the praises of Scrivener enough. And thanks to Keith for creating such a great product. You have a bevy of fans on this side of the pond! I am so glad I told you about this program! Now I have a super guru for my guide! I’m sending the ladies in VA this link. Gwen, this is great. Soooo helpful. I’ve been working with Scrivener for ages–love it–but didn’t know how to get the best out of it. Thanks!! Glad it helped! If you think of any questions, I’m planning to post another mini tutorial sometime soon. Heather: Labels and keywords work at the document level. To code a line of text, the only thing I can think of is to either use highlighter colors (which you can rename, if desired), or to select the text and add a comment. I guess you could also use Revision marking to color the text itself instead of the area around it. Ok, I guess that is what I will do then. Is there a preference I need to change somewhere? Hi, Stan. Glad you found the ideas useful. To color your file icons, go to the View menu and choose Tint Icons With Label Color. That will color the index cards and the icons in Binder. I have tried to print a synopsis and really wanted it to include the Titles that are on the cards, not just the information underneath. I cannot find a way to include and print the titles so the synopsis seems like random words. how do I get the synopsis to print AND include the Title of the corkboard cards. Hi, Donna. You can do that. 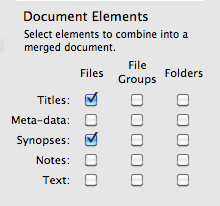 When you’re in Compile Manuscript, select Titles in addition to the check box for Synopsis. That’s it. Go to the link below to see a picture of what the check boxes look like for this to work. Good luck! Hi! Thanks for all these great tips! I had a small question I hope you can help me with: is there a way to change the label for multiple scenes at once? Yes there is, Minerva. Select the items, then right click (ctrl-click) on one of them to get a menu. From there you can choose either Label or Status and choose the value. Thanks!